Much like fellow poker icon Doyle Brunson, Berry Johnston has proven to be an iron man by playing poker into his late 70’s. And while he has not managed to notch any major victories in his golden years, Johnston has already done more than enough to earn his legendary poker status. Unlike some of the other poker greats who are all-too-quick to talk about themselves, Berry Johnston is somewhat quiet and modest. In fact, he spends much of his time avoiding the limelight and puts his focus on the tables. As for his back story, Johnston was born in 1935 in the small town of Bethany, Oklahoma. Despite being brought up by a very religious family, Johnston developed quite a knack for gambling. But poker was not his game back in these days, and he instead chose to bet on golf. Apparently Johnston must have been pretty good because he made a living as a golf hustler. In time though, golf would give way to poker. While many future poker pros grow up playing the game at their kitchen table, Berry Johnston did not actually learn how to play poker until he was 35. But the late start was not really a hindrance for Johnston because he picked up the game rather quickly. After experiencing some success around the Oklahoma area, the man they call “Numbers” was convinced that he could make a living by playing poker in Las Vegas. Texas Hold’em dominates the poker landscape these days with most major live and online tournaments revolving around this game. But when Johnston arrived in Vegas, games like Stud and Omaha were much more popular. So he specialized in the latter, and began earning a very nice living through Omaha. Of course, this is not to say that Johnston totally neglected Hold’em since he finished third in the 1982 WSOP Main Event ($104,000). Over the next several years, the Oklahoman continued to cash in various Omaha and Hold’em tournaments, and he even won a 1983 WSOP $2,500 Match Play tournament. In 1986, Johnston reached the pinnacle of his poker career by winning the WSOP Main Event along with $570,000. Despite being the world’s most prestigious poker tournament, the WSOP Main Event is not always won by skilled players. However, Johnston has proven to be a very respectable champion by winning the following WSOP tournaments after his 1986 victory: 1990 $2,500 Limit Hold’em ($254k), 1995 $1,500 Limit Omaha ($91k), 2001 $1,500 Razz ($84k). In all, Berry Johnston has won five WSOP gold bracelets, which ties him for 12th all-time in this category. – During his live poker tournament career, the 76-year-old poker player has earned $3,462,601. – Berry Johnston has 10 WSOP Main Event cashes, which is more than anybody else in poker history. – If there is one thing that defines Johnston’s game, it is bankroll management. In fact, many players have praised the 1986 Main Event champion’s bankroll management abilities. 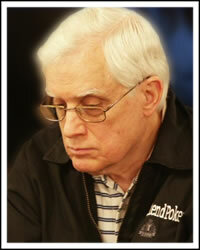 – In 2004, Berry Johnston was inducted into the Poker Hall of Fame.